Too Fat Lardies have just released a new Pint-sized campaign book for their Chain of Command World War II rules – Storming The Citadel. 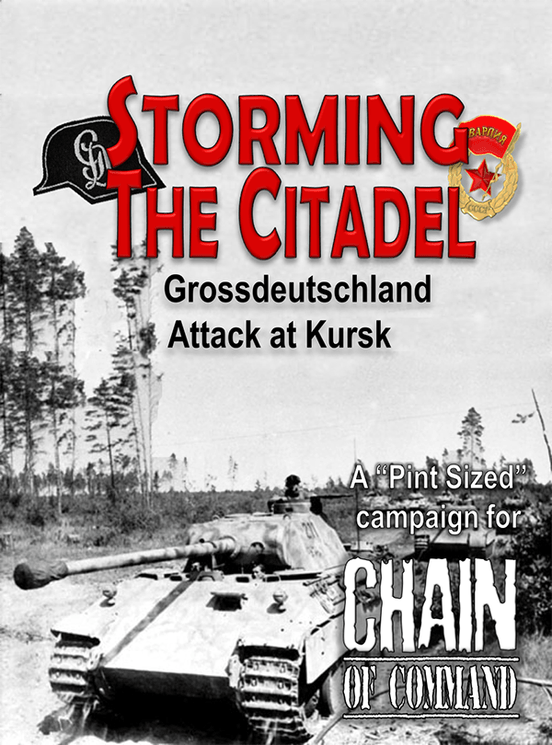 Taking a break from post D-Day France for the first time, this pint-sized supplement moves it’s focus to the Eastern Front and the operations of the German Grossdeutschland division at the start of operation “Zitadelle” (Citadel) which became known as the battle of Kursk. The 27-page PDF document contains the background to the German offensive operations in the Kursk salient, as well a six linked scenarios in which the Panzer Grenadiers of Grossdeutschland come face to face with two Soviet Guards Rifle Regiments . As with other pint-sized campaign books, you will need a copy of Chain of Command and At The Sharp End to use this book. Storming the Citadel is available for £3.80 from the Too Fat Lardies website.